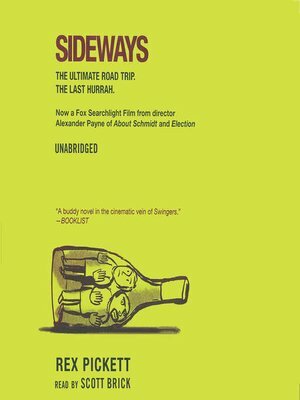 Sideways is the story of two friends, Miles and Jack, going away together for the last time to steep themselves in everything that makes it good to be young and single: pinot, putting, and prowling bars. In the week before Jack plans to marry, the pair heads out from Los Angeles to the Santa Ynez wine country. For Jack, the tasting tour is Seven Days to D-Day, his final stretch of freedom. For Miles—who has divorced his wife, is facing an uncertain career, and has lost his passion for living—the trip is a week-long opportunity to evaluate his past, his future, and himself. A raucous and surprising novel filled with wonderful details about wine, Sideways is also a thought provoking and funny book about men, women, and human relationships.